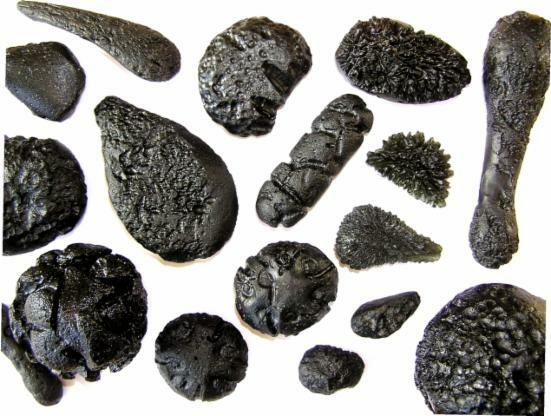 ABOVE: A variety of tektites from the Indochinese Peninsula, the Philippines, the Czech Republic, Texas, USA and Georgia, USA. To find out their importance, to differentiate them and to understand them - read on! Tektites are found in geographically restricted areas and are associated with asteroid or comet impact with the Earth. A number of previous hypotheses were put forward, including a lunar origin (from lunar volcanoes or lunar impact events). These alternatives are no longer taken seriously by scientists. It has been firmly established that tektites are terrestrial rock melted and flung into the atmosphere by the force of an asteroid or comet impact. Whilst a number of tektite strewn fields exist, the focus of this website is on the Australasian strewn field. This is the most recent strewn field, the largest and is unique due to the very low angle impact, which resulted in the formation of highly oriented forms typified by the much sought after flanged Australite buttons. ABOVE: An Australian tektite - this was flung around 6000 km from the impact site and was melted and re-shaped during atmospheric re-entry! Approximately 803,000 (+/-3,000) years ago (Yamei et al., 2000; also Lee & Wei, 2000 if the Brunhes/Matuyama (B/M) reversal boundary is adjusted to Sarna-Wojcicki et al. 2000) we were treated to a low angle asteroid impact somewhere in the Indochinese Peninsula. This created the Australasian tektite strewn field. For any primitive man (Homo erectus) in south-east Asia it wouldn’t have been so much a treat as a total annihilation. In the seconds that followed, terrestrial rock was vaporised and flung away from the site of impact. Seconds to minutes later tektites were raining down, concentrated in radial rays, across the whole of south-east Asia and Australia. It must have been a truly awesome and terrifying sight. The formation of an impact crater is demonstrated at the NASA Deep Impact site. The videos are excellent and well worth watching. My favourite is the Pumice Impact test side view (at the bottom of the page). 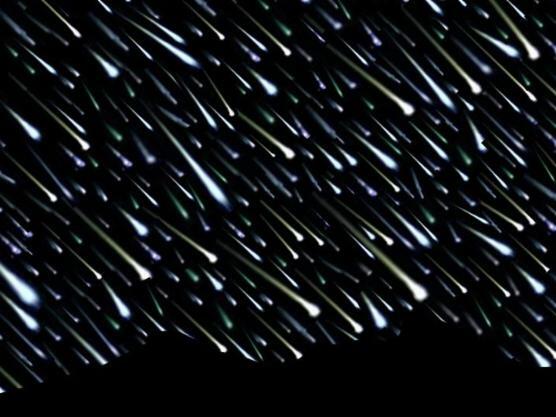 When the asteroid or comet landed on Earth, it's enormous kinetic energy melted the country rock, but some momentum was conserved and transferred to this melted country rock. Thus, a far-flung tektite was born! Tektites are found in many shapes and sizes. The different morphologies are geographically restricted and occur in a radial pattern away from the source crater. This website identifies the different morphologies and surface sculptures. It is then attempted to deduce what the morphologies and surface sculptures tell us about the formation of tektites. Tektites are made of glass, and it is the properties of glass which are so important in understanding the final forms we see today. Some controversy and misunderstanding still surrounds tektites, but finally we are getting to the truth and dispelling the myths. There is always more to be learnt though, so long live the debate: it is the enigmatic nature of tektites that makes them so appealing! ABOVE: Moments after impact thousands of tektites would re-enter the atmosphere creating an amazing and terrifying show.